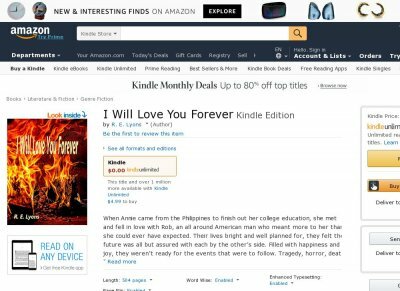 When Annie came from the Philippines to finish out her college education, she met and fell in love with Rob, an all around American man who meant more to her than she could ever have expected. Their lives bright and well planned for, they felt their future was all but assured with each by the others side. Filled with happiness and joy, they werent ready for the events that were to follow. Tragedy, horror, death, and bloodshed came into their lives, marring the beauty that had been, but through it all there was one constant. Come what may, no matter the cost, no matter who stood in the way, they vowed to each other I Will Love You Forever.